This April 13, 2016, file photo shows actor Aaron Paul and his wife, Lauren, in Los Angeles, California. 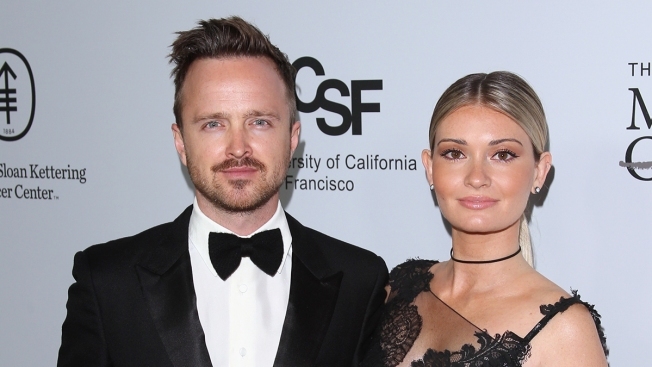 Aaron Paul's wife, Lauren, revealed on social media Wednesday that she is still recovering after giving birth to her daughter earlier this month, and detailed the breast infections she has been fighting. Lauren Paul revealed on Instagram that she's developed Mastitis, a painful infection of the breast tissue that can cause flu-like symptoms, usually occurring within the first three months of breastfeeding. Alongside a photo of her daughter, named Story Annabelle, the new mama shared, "I always heard things like 'you have never known a love like this,' or 'it's like your heart is living outside your chest,' from different parents while I was pregnant. It was hard for me to wrap my head around how deep that love could really be. Well, it's all true. She is everything. My world. Sometimes I just stare at her and cry over how precious and pure she is." Paul continued, "But let me also talk about some other real stuff here. This post labor chapter has been rough at times. Recovering from labor is no joke. I'm definitely on the mend in that department but... breastfeeding. Oh man." "While it's been one of the most beautiful experiences of my life," the 31-year-old added, "I have developed Mastitis twice within 3 weeks. For those of you who don't know what that is, it's an infection from breastfeeding that creates severe flu-like symptoms." Paul described fighting through the "sickest I have ever felt," writing, "The pain and aches were unbelievable." The Kind Campaign co-founder hopes that by opening up about her experience more women will discuss the pros and cons of breastfeeding. "If I could give an upcoming mother any advice for this chapter it would be to become well educated about breastfeeding," she offered. "Take a class, do your research or have conversations with other mothers. There are so many things that can happen." Paul then took a moment to applaud fellow moms: "I wanna give a big virtual hug to all the mammas out there who have had any type of issue breastfeeding or are dealing with anything physically or emotionally difficult, be it with you or your child. You are not alone."